Across Plaza Cong Xa Paris from the Basilica of Notre-Dame in Saigon stands the colonial-period Central Post Office [Bưu điện thành phố Hồ Chí Minh] of 1886-1891. The classical exterior façade names an array of Western inventors – among them Benjamin Franklin, Michael Faraday, Alessandro Volta and André-Marie Ampère. It was designed, for all the world like an iron-roofed railway station, by Gustave Eiffel (1832-1923) in the same period that he was working on his eponymous Tour d’Eiffel in Paris. Two evocative reminders of the French colonial era remain within – maps entitled ‘Lignes telegraphiques du Sud Vietnam et Cambodge 1892′ and ‘Saigon et ses environs 1892′ , respectively the telegraph network of South Vietnam and Cambodia and a map of greater Saigon. An elegant row of seven wooden telephone booths, surmounted by clocks giving international times, lines one wall of the central hall. This huge and busy Victorian relic offers all the expected post-office services, and some a visitor might not expect, such as pots of glue to deal with Vietnam’s non-adhesive postage stamps: http://www.loupiote.com/photos/3140179341.shtml. On my brief visit I missed Duong Van Ngo, the old gentleman in the post office who, well into his eighties, pens beautiful calligraphy for people who want to send important letters, such as business deals and proposals of marriage: http://www.spiegel.de/international/spiegel/the-man-who-writes-love-letters-a-day-with-saigon-s-last-public-letter-writer-a-470114.html. This entry was posted in Exploring Vietnam & Cambodia, Victorian Architecture on August 31, 2014 by Mike Higginbottom. Of all the interesting places I visited in Vietnam with Great Rail Journeys’ ‘Vietnam, Cambodia & the Mekong Delta’ tour, I’m most likely to return to Saigon, perhaps as a stopover en route to Australia or New Zealand. Our local guide was at pains to point out that the official name Hồ Chí Minh City is a formality which can lead to embarrassment, when disparaging the city insults the political leader, and so Saigon [Sài Gòn] is the customary name to use. 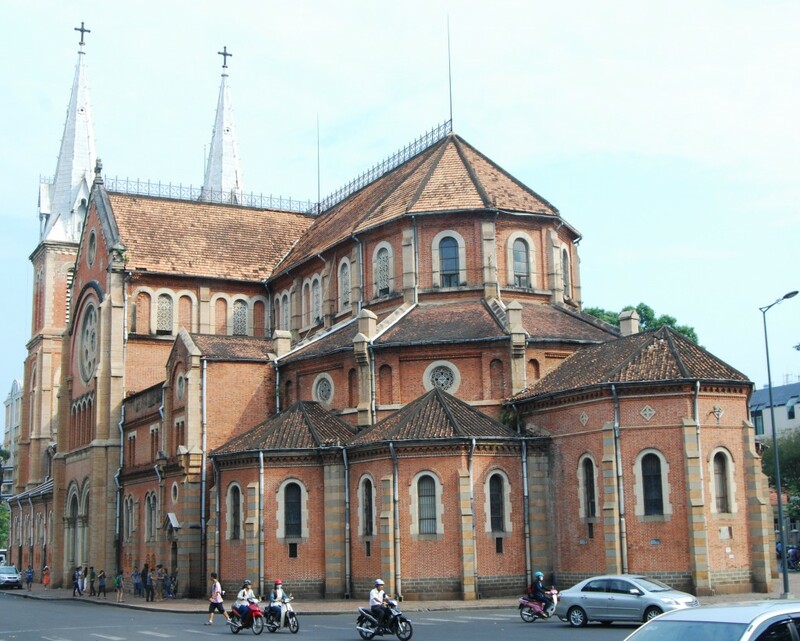 Across Vietnam I repeatedly spotted unmistakably Gothic churches which must reflect the French colonisation, but the only one I had the opportunity to visit, very briefly, was the Basilica of Notre-Dame in the centre of Saigon. Wikipeda meticulously renders its Vietnamese names Vương cung thánh đường Đức Bà Sài Gòn or Nhà thờ Đức Bà Sài Gòn as well as the Vietnamese rendition of its alternative title, the Basilica of Our Lady of The Immaculate Conception –Vương cung thánh đường Chính tòa Đức Mẹ Vô nhiễm Nguyên tội. Constructed entirely of French materials in a weird combination of Byzantine and Gothic styles from 1877 to 1880, the basilica’s Marseilles bricks and twin spires suggest a jazzed-up version of A W N Pugin’s Cathedral of St Chad, Birmingham. The towers were in fact additional, built to contain six bronze bells each in 1895. To the tips of the crosses, each tower is 60.5 metres high. At the time of construction these were the tallest structures in Saigon. Though Christianity is a minority religion in Vietnam, Notre Dame is heavily used. It has survived so many wars and upheavals, and remains a focal point in the city. This entry was posted in Exploring Vietnam & Cambodia, Sacred Places, Survivals & Revivals: past views of English architecture, Victorian Architecture on August 26, 2014 by Mike Higginbottom. There are two sites in Cambodia which every visitor should experience. Without them it’s not possible even to begin to imagine the evil of the Khmer Rouge, the genocidal regime that eviscerated the nation between 1975 and 1979. 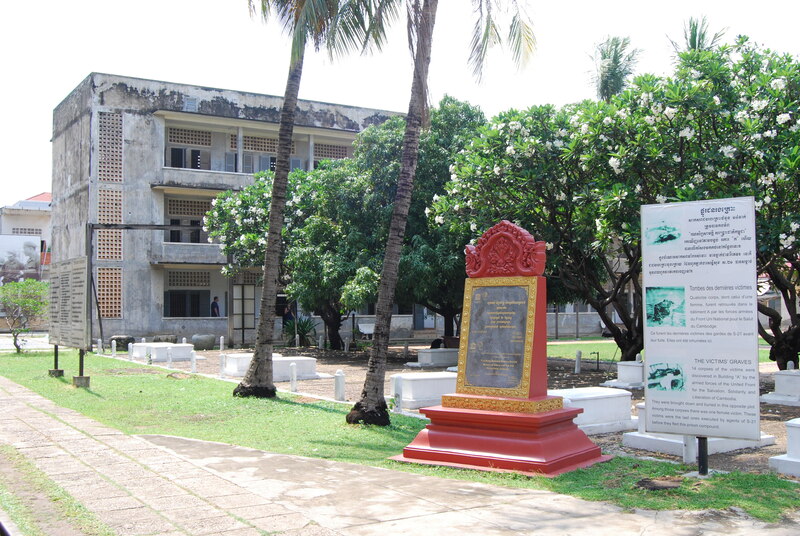 The first shock at the Tuol Sleng Genocide Museum in the capital, Phnom Penh, is that the buildings are a standard 1960s high school, four three-storey blocks of classrooms with open corridors and concrete staircases. This was the Chao Ponhea Yat High School, converted in 1975 by the Khmer Rouge into the notorious Security Prison 21 (S-21), in which as many as twenty thousand people were incarcerated and tortured before being transported to the “Killing Fields”, the Choeung Ek extermination centre. Toul Sleng was one of perhaps 150 such sites across Cambodia. When the Khmer Rouge fled in 1979 they left in place the last fourteen people to be tortured to death in the centre. The lowest estimate of the victims is seventeen thousand, and there were twelve known survivors, two of whom are still living. The site is presented largely as found, with the graves of the fourteen final victims set in a dignified enclosure. The classrooms remain, as they once were, classrooms, some still with blackboards. Some contain the rusty iron beds that were the instruments of interrogation, with photographs on the wall of each room as found. In one block the classrooms were partitioned into tiny cells, hardly big enough to lie down in, built of clumsy brick on the ground floor and timber on the first; on the top floor prisoners were simply stacked, side by side, head to toe, in chains. Other rooms are filled with displays of the mugshots which were routinely taken of terrified victims on arrival, male and female, all ages but many of them hardly more than school-age, [http://chgs.umn.edu/museum/exhibitions/cambodian/s21.html] together with other gruesome images of the centre in operation. Alongside the Choeung Ek Memorial [http://www.lonelyplanet.com/cambodia/phnom-penh/sights/museums-galleries/killing-fields-choeung-ek], which I didn’t have the chance to see, the Tuol Sleng Genocide Museum exists to remind future generations of horrors that must not be forgotten, for fear they may be repeated: http://www.tripadvisor.co.uk/Attraction_Review-g293940-d324063-Reviews-Tuol_Sleng_Genocide_Museum-Phnom_Penh.html. Tuol Sleng means “Hill of the Poisonous Trees” or “Strychnine Mountain”: http://www.edwebproject.org/sideshow/khmeryears/s21.html. This entry was posted in Exploring Vietnam & Cambodia on July 7, 2014 by Mike Higginbottom. It’s hard for a modern tourist in Vietnam to imagine the horrors of war that happened in such a beautiful country – not one war, but three, against France (1946-1954), America (1965-1975) and China (February-March 1979). It’s important for a Western visitor to adjust away from the conventional mind-set of films such as Platoon (1986) and Full Metal Jacket (1987) and even Good Morning, Vietnam (1987), in which the Americans are the “white hats” and the Viet Cong are the villains. The Củ Chi Tunnels tourist site lies 1½ hours’ drive from the centre of Saigon, yet this labyrinth of tunnels stretches for at least 75 miles and connects with the Saigon River. On the ground at Củ Chi it makes more sense to take the local viewpoint, “Why are these bastards bombing my village?” The ingenuity and the endurance of the six thousand Viet Cong guerrillas are astonishing: the site shows the contrivances to hide access and ventilation to the tunnels, and the fiendishly clever man-traps that were devised to deter American troops on the ground. A man demonstrates the manufacture of sandals from American truck tyres, deliberately designed with the brand-name upside down, to persuade troops that the footprints went in the opposite direction to the way the wearer was walking. There is a below-ground kitchen which emits no smoke to its surroundings. And we were invited to sample the typical Viet Cong diet of cassava (customarily used as cattle feed in Vietnam) and thin, unappetising tea. I declined the invitation to traverse a short stretch of tunnel, suitably enlarged for Western tourists: I decided that crawling on all fours in a claustrophobic space in 30°C temperatures wasn’t necessary to appreciate the rigours of fighting the Americans. But I’m glad I’ve stood on the ground where these things happened, felt the steamy heat, and seen a sanitised but realistic display of artefacts that connect to the reality of war. This entry was posted in Exploring Vietnam & Cambodia on July 3, 2014 by Mike Higginbottom. One of the disadvantages of travelling with a group across half a dozen time-zones is the difficulty of managing jet lag. In my first few days in Vietnam I trudged around more Buddhist temples than I really needed, not because they lacked interest but because I lacked sleep. In Hanoi I somnambulated my way round the Temple of Literature and up the parade-ground to the Hồ Chí Minh Mausoleum. We declined en masse the a two-kilometre walk to the Botanical Gardens and cut to the chase by walking across to the unique and evocative One-Pillar Temple, a place of pilgrimage for couples in hope of sons. But at the Thiên Mụ Pagoda amid a succession of shrines was a poignant surprise – the 1959 Austin car that drove the Buddhist monk Thích Quảng Đức to his self-immolation in June 1963. The Thiên Mụ Pagoda is significant in the religious conflicts within Vietnam at the time of transition from colonial rule, but it’s very difficult to appreciate in a tourist convoy. This entry was posted in Exploring Vietnam & Cambodia on June 29, 2014 by Mike Higginbottom. The second great surface-travel experience of the Great Rail Journeys’ ‘Vietnam, Cambodia & the Mekong Delta’ [http://www.greatrail.com/tours/vietnam-cambodia-and-the-mekong-delta.aspx#VMG4] is the day-long speedboat-ride up the Mekong River to the Cambodian capital, Phnom Penh. We spent the whole of Sunday sailing up the Mekong River from a place I’d never heard of, Cần Thơ, on a speedboat, a relaxing and revealing experience because the Mekong, with its various tributaries and distributaries, is a working river. Its vessels range from tiny craft to huge coasters, carrying sand, rice and bricks to the coast, and there are ro-ro ferries of various sizes plying crossings at intervals. The distributary from which we started was as wide as the Mersey at Liverpool; upstream we joined a channel that was nearer to the width of the Humber at Grimsby. 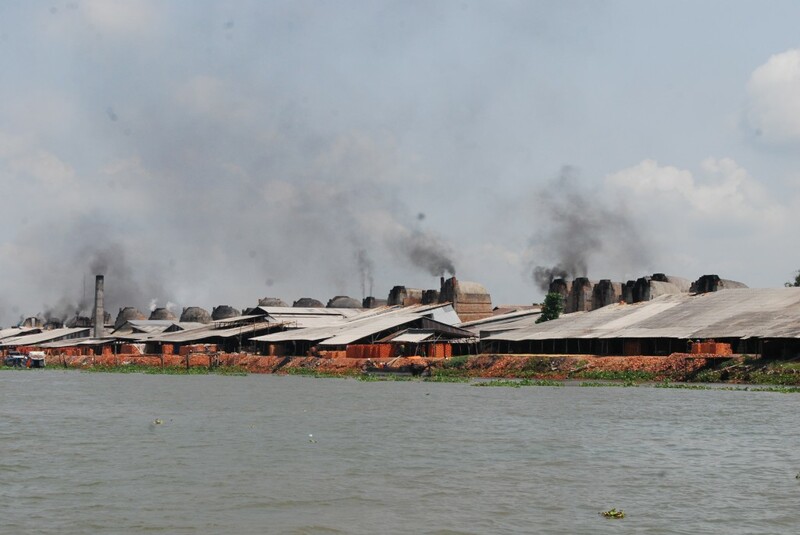 There was a particularly impressive stretch of river lined with brick kilns, pouring out black smoke, a reminder that the smokestack industries that Britain eliminated after the Second World War remain in the Far East. Before leaving Vietnam the crew topped up the tanks with fuel, while members of our group tried to work out what two young boys were doing in the water. It appeared they were washing a dead pig. The Vietnamese formalities were negligible: our passports were processed by the boat crew, and all we had to do was get off the boat, sit around for five minutes and get back on again. There was no attempt to match the passports to the people whatsoever. In between the two border posts the crew lowered the Vietnamese flag at the bow and raised the Cambodian one, which seemed a polite gesture at least. At the Cambodian border post a short distance upriver there was the full performance of queuing at a window, and much stamping and scribbling by a heavily uniformed officer, while the lady from the boat stapled slips into passport pages. The process was lubricated by another member of the boat crew silently and dutifully delivering a couple of cases of Tiger Beer behind the counter. The Cambodian stretch of the river contrasts starkly with downstream. Suddenly the industry, the river-traffic and the populace vanished, and for well over an hour we travelled past fields with very few signs of activity and none of prosperity. It’s clear that this place is decades behind its neighbour. When you read up the history the reasons are obvious: this is a nation with a tragic past of urban depopulation, genocide, famine. No Cambodian family is untouched by this late-1970s trauma, yet apparently more than half its young population have no direct memory of it. There are oddities about being in Cambodia. A member of our group darkly remarked that the BBC News feed was running nine minutes late. This entry was posted in Exploring Vietnam & Cambodia, Life-enhancing experiences, Transports of Delight on May 30, 2014 by Mike Higginbottom. 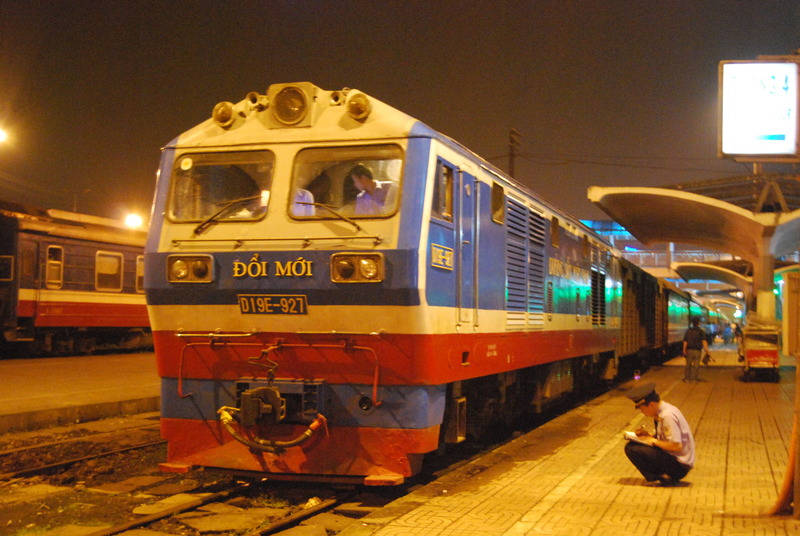 One of the highlights – and for me the raison d’être – of Great Rail Journeys’ ‘Vietnam, Cambodia & the Mekong Delta’ holiday [http://www.greatrail.com/tours/vietnam-cambodia-and-the-mekong-delta.aspx#VMG4] was the opportunity to travel the whole way from Hanoi to Saigon by rail. Vietnam’s North-South Railway, built by the French colonial government between 1899 and 1936, was heavily bombed by the Americans. It triumphantly reopened as the Reunification Express in 1976. In Great Rail Journeys’ itinerary this journey starts with a so-called “soft sleeper” from Hanoi to the royal capital of Hue, and thanks to this operator’s standards of customer care I had a four-berth compartment entirely to myself and a comprehensive collection of food and drink supplies to last till morning. The most spectacular part of the North-South Railway is the stretch south of Huế, where the line hugs the coast as it climbs through the Hai Van Pass in a series of sharp curves, viaducts and tunnels: http://www.seat61.com/Vietnam.htm#Watch_the_video. 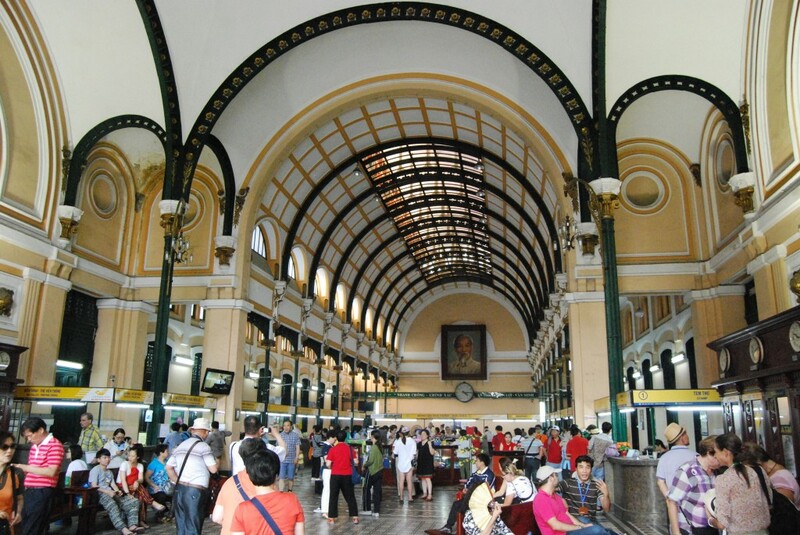 Visitors knock the Vietnamese State Railways but from my observation they’re efficiently run. It’s hardly surprising that a thousand-mile route that takes thirty-odd hours to traverse will experience delays: one of our trains reached us an hour late and arrived at its destination almost on time; presumably there’s slack in the timetable to compensate for eventualities. Some speed restrictions are as low as 5kph, where eighty-year-old infrastructure that took a severe hammering through a serious of wars is being brought up to modern standards. At any rate, the crews always turned up, we were never decanted on to a replacement bus service and there were no leaves on the line. This entry was posted in Exploring Vietnam & Cambodia, Transports of Delight on May 26, 2014 by Mike Higginbottom.